Think you have what it takes to make one of these cordoroy blue jackets look good? Being an officer of the Wakefield FFA Officer is a privelege and a commitment to almost 150 FFA members that you will be a leader of the organization. As an officer you are committed to participate in leadership events throughout the summer and school year, work at the NC State Fair's Children's Barnyard and Demonstration Garden, collaborate with the FFA Alumni, participate in Career Development Events, and attend all of the meetings that are for all FFA members. 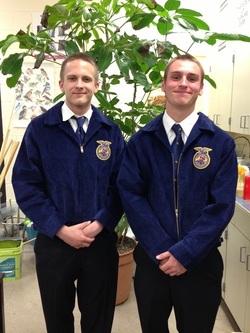 In addition, FFA officers have bi-monthly SMART lunch meetings and additional social engagements and leadership functions with the Wake FFA Federation. Being a FFA Officer isn't the biggest commitment of your high school year's but it certainly can be one of the most rewarding. The Wakefield FFA is a diverse group of students that you can play an important role in their leadership development. So think about becoming a FFA Officer for WHS. Applications are below and are due at the end of April each year.